It’s a common assumption that people choose nutritious foods because they know they should while people who don’t are being lazy or don’t care. However, we actually find that people choose food for a variety of reasons and only one of them may be nutrition. Other influences may be cultural, societal, accessibility, cost, food preferences, food beliefs, emotional states, environment and food marketing, to name a few. To truly help someone adopt more healthful food patterns, it’s imperative that we understand these influences. If we do, we will see just telling someone what they should do won’t likely be effective or helpful and may only increase the confusion they feel. Instead, we should aim to understand and help them overcome hurdles. Registered dietitian Ellyn Satter gives us insight into how to do that. She is best known for her Eating Competence Model, which is meant to create harmony between our food “wants” and our food “shoulds.” Eating competence is measured by this validated tool, The Eating Competence Survey. Being a competent eater is directly correlated with nourishing and healthful food patterns, normal lab values, better sleep and more consistent physical activity. If someone is found not to be a competent eater, the treatment would be to help them develop eating competence rather than assume they don’t care about nutrition. 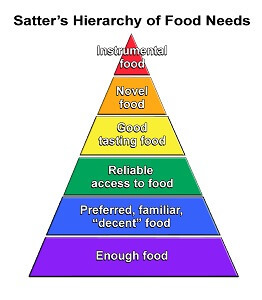 In fact, Satter describes the pathway to eating competence to be much like Maslow’s Hierarchy of Needs; if an individual hasn’t met their lower level needs, they won’t have the tools, skills, motivation or desire to reach higher levels of need. 1. Having enough food to eat. People at this level are driven by hunger and anxiety about getting enough to eat. If you are food insecure, on a restricted diet or found without food when you are hungry, you’ll want calorie dense foods – foods that will fill you up quickly. 2. Having enough acceptable food to eat. In addition to having enough food to eat, it’s important to have the types of food you enjoy. Much of this is personal preference as well as food that is not rotten or something you’re allergic too, etc. 3. Having reliable, ongoing access to food. Food security is found in knowing that your food needs are met at this meal AND future meals. You can plan for meals, have ingredients on hand, and have the ability/permission to eat again when you are hungry. 4. Having good tasting food. When you aren’t starving or worried about having enough food to eat, you can afford to be a little pickier about what foods you eat. Most people prioritize taste (over nutrition) when selecting foods; that’s very normal! 5. Having novel food experiences. This is where you may become more adventurous in your eating, trying new foods and new recipes. You value flexibility and variety and feel competent in navigating that in terms of your food preferences AND nutrition. 6. Using food in an instrumental way. This final level is where people want to jump straight to, but in reality most people are too traumatized by diets to comfortably consider the nutritional balance of what they are eating without a lot of guilt, frustration and overwhelm. In reality, no one actually needs to reach level 6 to be a competent eater. This level is optional. Progressing through levels 1-5 will be adequate for you to eat in ways that are nourishing AND satisfying and take into account your health and wellbeing. I’ve written on this subject before here: How to care about what you eat without really caring at all. Essentially, nutrition information for influencing health is most effective when someone has enough acceptable, enjoyable food to eat consistently. If someone is experiencing food insecurity due to economic constraints or self-imposed restrictions through dieting or disordered eating, which is causing them inconsistent and inadequate food patterns, they won’t be ready to make changes that are truly sustainable and realistic. In fact, nutrition information at that point could just feel more polarizing and overwhelming. Health can feel like a vague term, but I think the WHO gives us some perspective here: health is a resource, not the objective of living. If we are promoting health, we should be doing it in a way that leads to overall physical, mental, emotional, social and spiritual well-being. When we reduce nutrition to a set of rules, we miss the bigger picture. You will feel good about your eating and be reliable about seeing to it that you get fed. You will get better and better at eating as much as you are hungry for. Having “forbidden foods” at meals and snacks will make them ordinary foods that you can eat in ordinary ways. Not making yourself eat fruits and vegetables will turn them into foods you eat for pleasure. Big servings won’t make you overeat. You will eat it all if you want to, not if you don’t. There are ways to improve nutritional intake, but contrary to popular belief, it isn’t through more nutrition information. 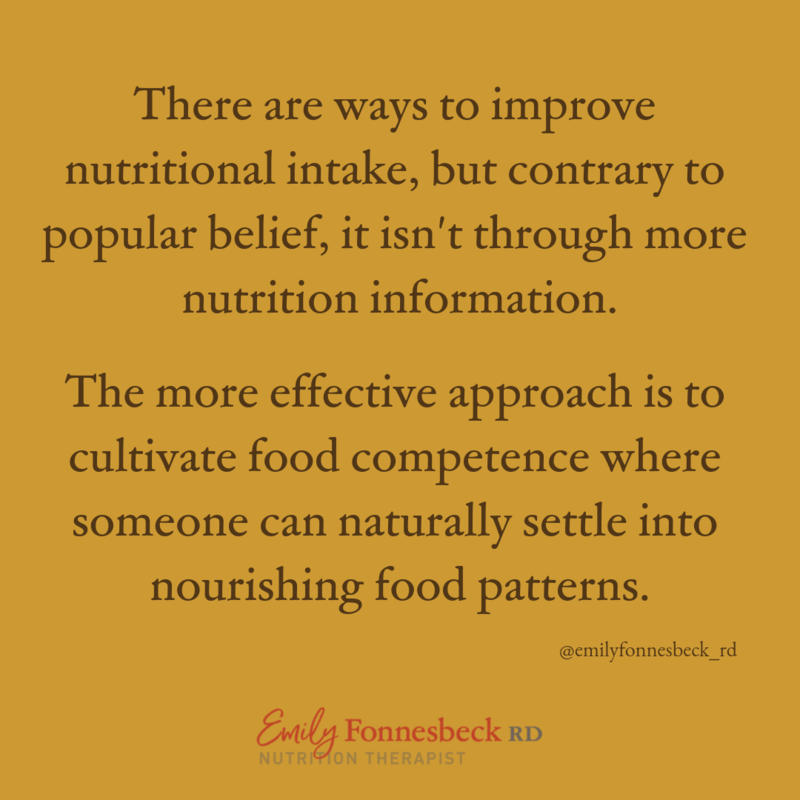 The more effective approach is to cultivate food competence where someone can naturally settle into nourishing food patterns.